If you want to feel accomplished at the end of the day; feel like you actually moved a project, task, or your team along; if you want to stop putting out fires all day - train yourself and your team to think IMPACT. No one should have more than six direct reports; otherwise you are constantly reacting to your team’s needs and putting out fires all day rather than making progress on any given area in your company or department – reactive mode. Not only must you have the discipline and determination to spend five minutes of every day to take control of your time, you must then have even more discipline and determination to stick with that plan throughout the day. To build your business you need to insist on being in a primarily proactive mode. To accomplish this, time management and a change in perspective are crucial. 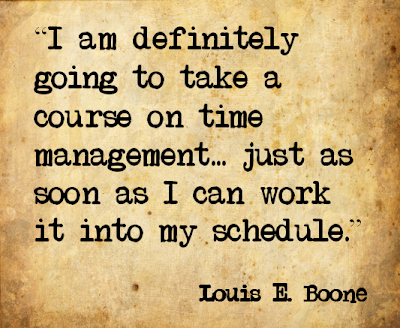 Leaders of companies need to be absolute experts in managing their own time, and put the systems in place to make sure that everyone in their organization is skilled in time management as well. That includes tools, systems, training and follow-up. Break your company or department down into “impact areas”. Any part of your company or department that has a direct impact on the bottom line is an impact area. Now take those impact areas and designate a one-hour weekly meeting for each impact area. This is the time when everyone involved in that impact area can focus exclusively on improving that area. You will have to instruct your team and discipline yourself to hold ideas, comments, questions and inquiries until the appropriate meeting to explore them in depth. You must apply discipline and determination to make this work. So, if someone comes to your office for a “got-a-minute” meeting, STOP. If you find that you have allowed yourself to be distracted by a random task or idea, STOP. Ask if this is something that cannot wait until the weekly impact meeting. If it can, write it down in your impact notepad (more on that) and put it away. This will not be easy for you or your team, but you must train to hold almost everything until the weekly meeting. It will take time and will feel very uncomfortable, but you will all learn to appreciate this new skill and tone your concentration muscles. Keep a pad for each impact area to keep notes, track progress, write down the "it can wait" ideas, next steps, etc. At the meetings do not ask for too much to be completed. Make the gains small but constant. If you are making small incremental gains each and every week, think of the profound transformation you’re going to have in 52 weeks! Identify the impact areas in your business.